There was an error in calculating C 3 & C M (Consecutive 3 or less runs and maidens). 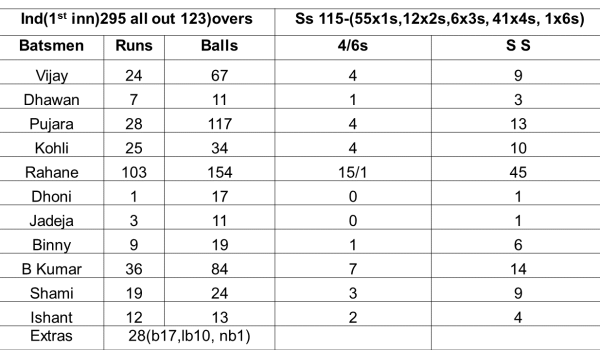 Here is a correct counting in the scorecard. (130)…3rd T20I England in New Zealand, Wellington, 15th Feb.
(125)….1st T20I New Zealand v/s England, Auckland, 9th Feb, 2013, Auckland. 22 Nov 2011 Last updated at 12:18 pmAussies in SA : Honor restored!. Australia in South Africa, Nov 2011. Series level 1-1. 2nd Test, Johannesburg, Nov (17-21)2011, Australia won by 2 wkts. Target: 310 Runs to win in 4 ½ sessions, approx (127) overs. 1- * Australia managed to keep their honor of not losing a Test series in South Africa for 41years. Only twice they lost in South Africa(1966 &1970) and since then, in 6series, they won 4 and leveled 2. 2- *In last 4years, only four times Aussies won a game without any of their batsmen scoring a century, and in this period, they played 48Tests & won 23. 3- *Pat Cummins made his Test debut, he became 423rd Aussie to wear the Baggy Green. In last 4years there have been 24 debutants for the Australians. 4- *This year itself (2011)Test cricket has inducted 41 debutants in 31Test matches(inclusive 3rd Test West Indies v India). 2nd Test, Nov(14-18)2011, Kolkata, India won by an inn and 15 Runs. 1- –So far both West Indies & India have played maximum Tests. 2- –For the first time this year, both (WI & Ind) scored > 400 score in a Test Inn. 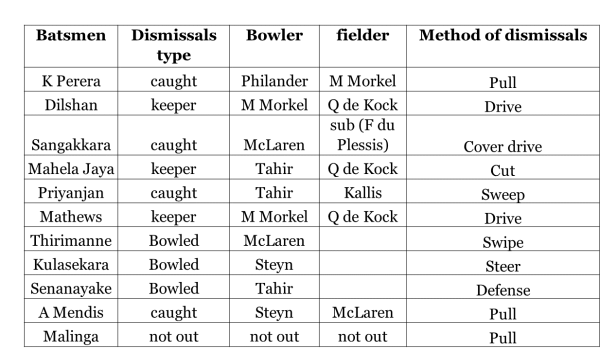 3- –West Indies batsmen were victims of most L B W dismissals this year. In 9 Tests(18 Inns)39 batsmen were L B W, which is 23.78 % of their total wickets. 4- –Interestingly for India, there was not a single 100+ partnerships for the first and second wicket this year. 5- –16centuries were scored against the India bowling, & surprisingly only 6 against the West Indies bowling attack!. 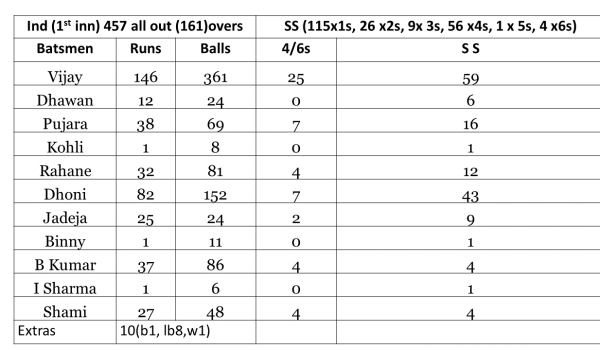 E Explanation of indices used in this scorecard. 1st Test , Nov 9-13, 2011, Cape Town. South Africa won by 8wkts.